The following day was our travel day between Great Sand Dunes and Mesa Verde. It’s only about a four hour drive, so there was no need to rush. Along Highway 160 we crossed the Continental Divide at Wolf Creek Pass, elevation 10,857 feet, and then rapidly descended 5,000 feet into southwestern Colorado. There is a notable National Monument along the route, Chimney Rock, which just became a monument in 2012, but the tour length and schedule didn’t work well with our timing, so we just satisfied ourselves with the view from the highway. Lunch time coincided nicely with our arrival in the quaint mountain town of Durango. We’d looked up some restaurant options ahead of time and naturally decided on Steamworks Brewing. Durango’s Main Street is a nice place for a walk, and it would surely provide lots of activities for a longer visit, including the famous Durango and Silverton scenic railway, if you have the time. 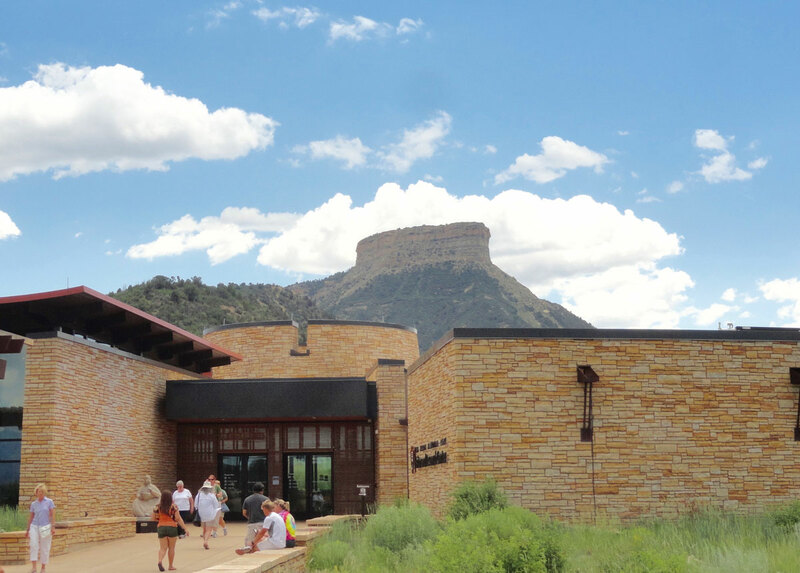 Mesa Verde visitor center with Point Lookout in the background. Continuing on, it’s just another 40 minutes to the Mesa Verde visitor center, and as soon as you pass the town of Mancos, the parks comes into view. We weren’t expecting such a dramatic landscape, but the park occupies a mesa (or more accurately a cuesta) that towers 2,000 feet above the valley to its north, making for a grand approach. The main visitor center is located just off the highway, this is where tickets can be purchased for the dwelling tours that require a park ranger guide. We had purchased a twilight tour of Cliff Palace online ahead of time and upon arrival here added tours of Balcony House and Long House (which can only be bought in person). Keep in mind that of the large dwellings, only Spruce Tree House and Step House are self-guided. Our Cliff Palace tour was scheduled for 7:00PM in the southern reaches of the park, so we had a few hours to make our way there. The steep Mesa Top Ruins Road begins its climb up the edge of the escarpment just beyond the visitor center. At the turn for the campgrounds we took a right to get to the trailhead of the Point Lookout Trail that leads to the high point of land we could see approaching the park. It’s a 2.2 mile round trip with the half mile closest to the parking area being very steep with a ton of switchbacks. After that it levels out along the top of a thin ridge and emerges from the vegetation onto a bare rock ledge at the tip. A sheer cliff drops hundreds of feet on all sides before reaching a steep slope to the valley floor below. 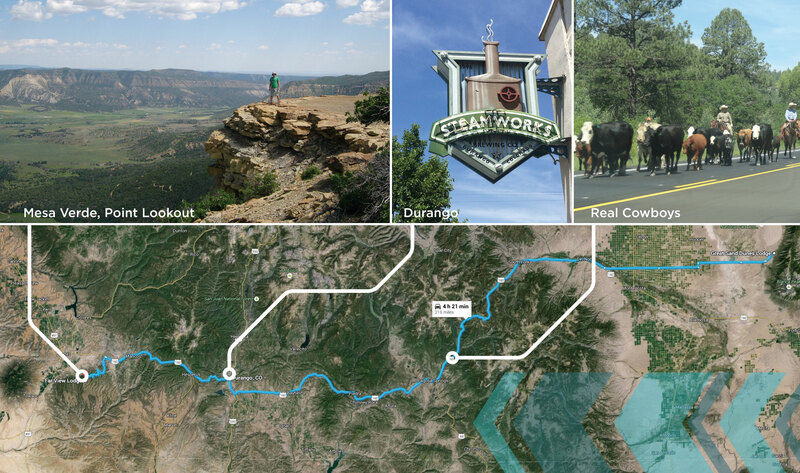 From Point Lookout, views stretch over the Montezuma and Mancos Valleys to the La Plata Mountains to the north and the distinctive Sleeping Ute mountain to the west. Being mostly known for Ancestral Puebloan archaeology, Mesa Verde doesn’t advertise itself as a hiking destination, so this trail was a nice surprise. Next we stopped by Park Point, which is the highest elevation in the park but is not as dramatic as Point Lookout. Here, a very short trail leads from a parking area to a fire lookout at the peak. There’s a 360 degree view and interpretive signs to tell what distant landmarks can be seen. A few miles beyond Park Point lies the Far View Area, a cluster of visitor buildings including a cafe, gift shop, restaurant and our lodging for two nights, the Far View Lodge. This is the only non-camping lodging located within the park and we highly recommend staying here for convenience. Visitors who stay outside the park in nearby towns have a long drive in and out of the park each day, Far View is 15 miles from the park entrance and just 6 miles from the major cliff dwellings. Our room contained the all-important refrigerator and coffee maker and featured a balcony with a sweeping view toward the south, we could even see Shiprock 45 miles away in New Mexico. After getting settled in, it was time to drive to Cliff Palace for our 7:00 Twilight Tour. Ranger Marie Clark met our group of 15 at the overview point and led us down steep, rocky stairs to the dwelling below. Approaching Cliff Palace in person for the first time goes up there with the first view of Crater Lake or seeing Denali on a clear day on the National Park “Awestruck” meter. Photos just don’t do it justice. Ranger Marie playing the part of Jean Pinkley. As part of the twilight tour experience, each guide plays a character to help bring the stories to life. Ranger Marie assumed the identity of real 1950s-60s Mesa Verde archaeologist Jean Pinkley for most of the tour. We learned about the ways of life of the Ancestral Puebloan and the discoveries of the cliff dwellings through the eyes of Jean. After touring the site and seeing ceremonial kivas and an ancient painting, we left the site by climbing up narrow ladders between boulders, giving us an extra appreciation for the skill it took to live in cliff dwellings. The following day was a full day in the park and we planned to cover a lot. We started with a tour of Balcony House led by Ranger Drew. Balcony is the most adventurous tour because entering it requires climbing up a 30 foot ladder and exiting involves crawling through an 18 inch wide tunnel, followed by three ladders up a rock face. One of the most memorable things about this house, aside from the view, is a handprint “painted” in the rock by a resident. It’s one of those little surprises that reminds you that “woah, this stuff is 800 years old.” Next we headed to the nearby Chapin Mesa area to see the artifacts in the Archeological Museum, it’s a nice collection and worth a walk through. 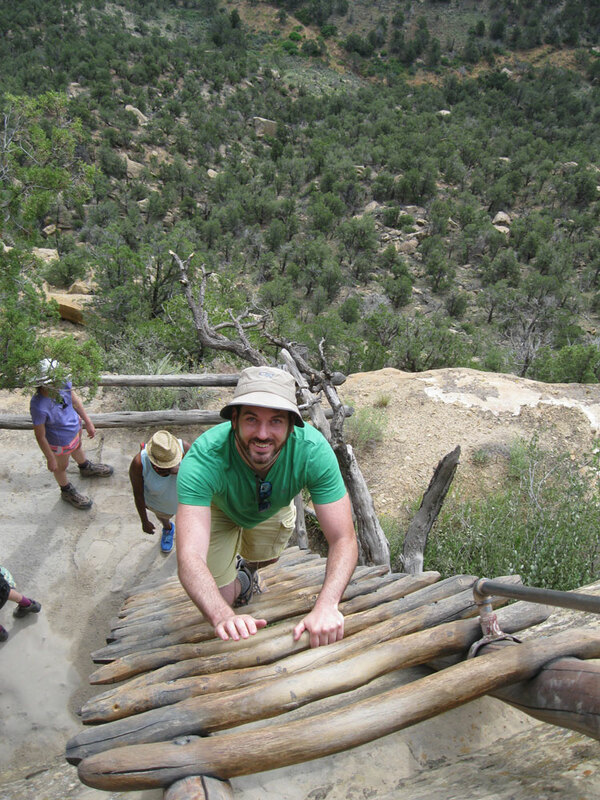 Just outside the museum are some of the other major hiking trails at Mesa Verde. A short trip below is Spruce Tree House, the most restored of the park’s dwellings. A turn before Spruce Tree House takes hikers on the 2.4 mile round trip Petroglyph Point Trail to the largest collection of petroglyphs in the park. The trail is relatively level once you make the initial descent, but has some ups and downs as it hugs the edge of the cliff above Spruce Tree Canyon. Around the halfway point, the 30-foot wide panel of petroglyphs appears above the trail to the left. The guidebook available at the trailhead has an interpretive diagram to explain the symbolism. Immediately after leaving the petroglyphs, the trail makes a brief but steep climb and then follows the canyon rim all the way back to the Chapin Mesa area. Keep in mind that the first half of the hike is mostly in shade, but the second half is completely exposed to the sun, so take lots of water and sunscreen. We then completed the Mesa Top Loop road, stopping along the way to see the pit houses, Square Tower House and a distant view of Cliff Palace. Long House at Wetherill Mesa, the second-largest dwelling in the park. We had a 5:00 guided tour of Long House scheduled, which is a 30-40 minute drive from Chapin Mesa, so we freshened up a bit at our room at Far View and then drove the curvy road to the remote section of Mesa Verde known as Wetherill Mesa. This area is far less visited, which is nice, but there is only a small ranger station and snack shop for services. We met our ranger guide under the tent and hiked down the Long House Loop paved trail to the entrance to Long House. There used to be a shuttle that drove this loop, but currently it has to be walked or biked. Bringing a bike would be great for this area, but the only bike rentals currently available are outside of the park, too far to easily make a single-day rental. A steep, but fairly easy hike leads from the paved trail to Long House, the second-largest cliff dwelling in the park that was once home to as many as 150 people. 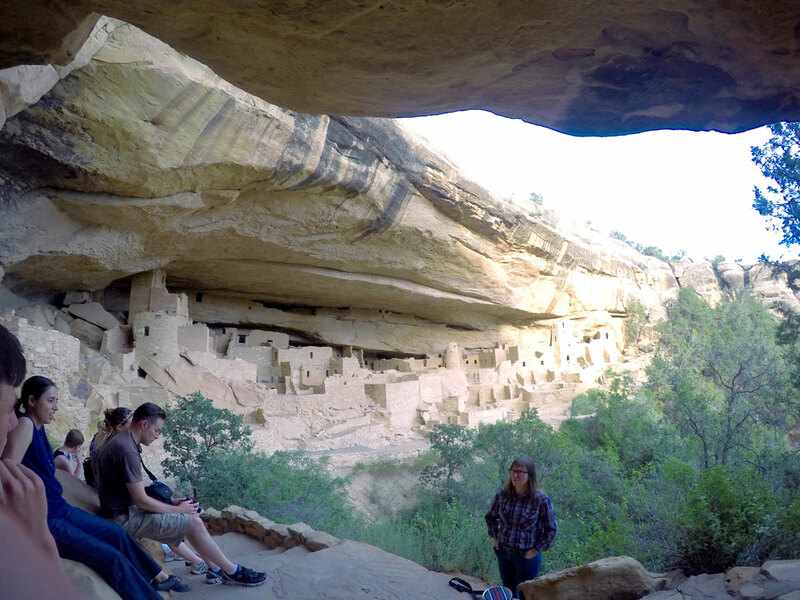 Mesa Verde is more developed and has many more food options than Great Sand Dunes. Both nights we stayed at Far View, we dined at the Metate Room, a full-service restaurant featuring Southwestern inspired food made with local ingredients. Elk Shepherds Pie is their specialty and they have some interesting Colorado wines on the list as well. The La Mano Lounge upstairs offers appetizers, drinks and a large rooftop patio perfect for enjoying a beer under the stars while watching distant thunderstorms. The nearby Far View Terrace restaurant is a good option for more casual dining with cafeteria-style service, we enjoyed breakfast there. A perfect lunch spot was the Spruce Tree Terrace Cafe adjacent to the Chapin Mesa Archeological Museum. Lunch and dinner is served there and you can take a picnic to-go to eat in the park. Their specialty is the Navajo Taco, which was enormous and hit the spot after a morning of exploring and hiking. 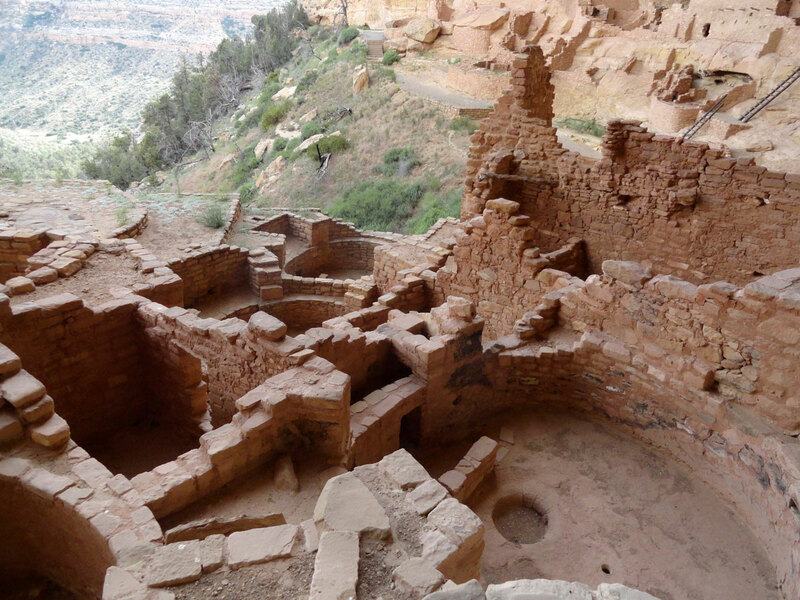 Overall, Mesa Verde proved to be one of those great “total package” National Parks, with history, culture, scenery, hiking, lodging and dining all well-represented. Put this one on your must-visit list. This entry was posted in Destinations, Maps, Travel Resources. Bookmark the permalink.